Our nation’s money comes in to existence through debt. As more money enters the economy, the more debt we have (Government or private). Counter-intuitively, what benefits the individual does not benefit the nation as a whole. In fact, if we all repaid all our loans, there would be 98% less money left in the economy because, as it turns out, only ~2% of our nation’s money supply is issued by the RBNZ — as notes and coins. So there you have it. Banks create our nation’s money supply when credit is drawn (monetized), destroy money when loans are repaid, and profit immensely from the interest charged on the loans. Most bank profit is obtained from the difference between interest we pay for these loans (created credit) and the interest they pay out for the corresponding deposits. The four big banks in NZ were making record profits in 2014, with ~4.3 billion dollars heading offshore to Australia and beyond. This is hard-earned New Zealander’s money leaving our real economy, and being transferred to the private banking sector. Sovereign money advocates term this concept “economic rent” and claim that private banks, seeking to maximise profits, shouldn’t be “renting” money to Government, businesses and citizens of a free, sovereign country. This growing money supply and these growing debts are also secured by NZ’s assets, resources and labour force (you). If we had a Government issued money supply requiring banks to have 100% reserves for money they lend, we would see dramatic improvements in our economy. We could have both less debt and enough money to thrive. The International Movement for Monetary Reform proposes just this and has gathered a huge following since the 2008 global financial crisis. This “sovereign-money” proposal proved itself when it was modeled by the International Monetary Fund**. Their analysis showed that the benefits of 100% reserve banking would be: dramatically reduced public and private (net) debt levels (because money creation no longer requires simultaneous debt creation), better control of business cycle fluctuations, complete elimination of bank runs, output gains of 10% and that inflation can drop to zero without posing problems for the conduct of monetary policy. It is great the IMF analysis has concluded something that also seems intuitive and logical. Sovereign money advocates extrapolate further that the outcome would also be far reaching throughout our economy and our lives. They say it could also improve: the inequality gap, child poverty, housing bubble control, student debt, state asset sales, job security, local businesses performance (due to the 10% higher output gains), budgets for local community projects and facilities, health care and education. It’s not a bad outcome for one law change: 100% reserve banking. The irony is that the law would change to how most people think it actually works now — where our Government issues the nation’s money supply. It simply requires updating the 1844 Bank Charter Act, which forbade banks from printing notes. If only they’d included something to prevent ledger balance accounting tricks, creating credit — which they have done to this very day! One obstacle is the general lack of understanding about how the monetary system really works by both the public and many politicians. There is also a fairamount of inertia and political resistance to the reform. The change is a big one, so is therefore daring and challenging. Some politicians fear sovereign money because it may affect NZ’s Standard and Poor’s (S&Ps) credit rating. S&Ps may mistrust the Government thinking they would simply issue too much money too easily, causing an inflationary crisis, creating a currency devaluation, which would in turn affect trade. Realising the importance of “why” we should address a problem, motivates people to find the “how”. Money reform advocates found it was not rocket science. Their solution could work in much the same way that the RBNZ independently oversees monetary policy now. A democratic, transparent and accountable body (Monetary Policy Committee) could independently separate the function of money issuance from money spending. 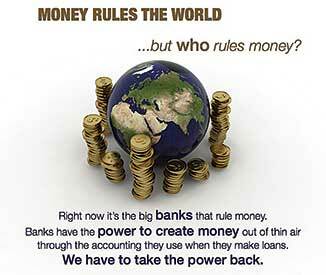 They would be tasked with the role private banks have now: creating and destroying the nation’s money supply. This could be done exactly as needed — debt free — within inflationary limits. Our government would also have greater control over where and how our money is spent, and would be able to steer the economy with greater precision. Here’s a thought: if this scenario was already the status quo, and it was now proposed to turn our nations’ money supply over to commercial corporations (banks), whose mandate it is to maximise profit, as debt-based money, there would be pandemonium on the streets! Money is an abstract concept — designed by humans to serve humanity’s needs. Let’s make it do this well. It is not a law of nature to have a debt-backed money system: it can be redesigned. The present design is not working well, and as Albert Einstein said, “insanity is doing the same thing over and over again and expecting a different result”. Please support politicians embracing sovereign money and share this information — an excellent source of further material is Positive Money NZ (www.positivemoney.org.nz), the NZ chapter of the International Movement for Monetary Reform (www.internationalmoneyreform.org). **(IMF working paper “The Chicago Plan Revisited” 2012 — Kumhof and Benes).